As a child I was delighted by the appearance of transparent cellophane-wrapped and plastic display packs of glacé fruits that then seemed to be acceptable currency in Christmas gifts from distant cousins, or my father’s more distant business connections. I was seduced by the palette of bright, translucent colours and diverse textures, the geometry of the compositions and perhaps even then the botany of desire. The promise of these compositions perhaps surpassed the experience of their consumption but we still enjoyed the fruits late on Christmas day. Glacé fruits are hardly moreish – one segment of any type of fruit often seems adequate (and in certain cases a surfeit) which is perhaps why they survived the depredations of three boys well into the Christmas holidays. Foods associated with Christmas are usually flatteringly described as rich – although a more accurate description might be fatty or sweet (and often both). In our tradition roast turkey and cranberry sauce, Christmas pudding and brandy butter, mince pies and even the assortment of nuts, muscatels and glacé fruits are abound in fats and oils and sugars of diverse origins. The feast for the winter solstice, later adopted to celebrate Christmas, was perhaps just as important in maintaining morale through winter and celebrating the turning point in diminishing day length but the fats, oils and sugars certainly would certainly have been welcome relief to a rationed diet. The ready availability and low cost of sugar today (and the associated challenges for a healthy diet associated with sugar’s infiltration into packaged foods) obscures the scarcity of sugar in ancient civilisations. Beyond the cradle of sugar cane in southwest Asia the most accessible sugars for ancient civilisations were generally those available in fruits and honey. The latter is of course the most concentrated. Indeed the collection of stored solar energy in the form of sugars by bees and their transformation honey represents an astonishing miracle of co-operation between flowering plants and bees in transforming light into sweetness (assuming you can stomach the honey bee’s processing of nectar through regurgitation). The use of honey extended beyond direct consumption to exploring honey’s values as a preservative. Classical Roman literature chronicles the pre-cursors of today’s glacé fruits utilising honey in the absence of access to crystalline sugar. 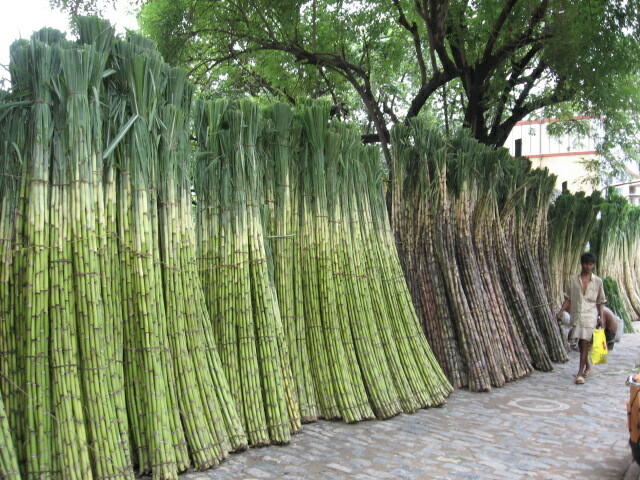 Sugar cane (Saccharum officinarum) is familiar as a crop in tropical Australia although the importance of sugar as a plant that changed the world is largely overlooked. Sugar cane originated in New Guinea. Domestication saw the development of a complex aggregation of hybrids and the development of sophisticated cultivation and processing techniques, especially on the Indian sub-continent with Sanskrit records dating back to 500 BC. Sugar cane was traded through India to reach Persia, and then the eastern Mediterranean with Arab conquerors in the 12th and 13th centuries. By the 14th century Cyprus became a major producer using the labour of Syrian and Arab slaves. Eventually sugar cane made its way to Sicily where a familiar pattern of enslaved or coerced labour, relatively large land units, and well-developed trade was established. Sicily was considered to be a model to be followed by the Portuguese and the Spanish in their own colonies in the Atlantic such as Madeira and the Canary Islands. Sicilian germplasm and knowledge and experience in cultivation and processing was sought and applied. With the establishment of Portugese and Spanish colonies in the Americas, the African slave trade and the sugar trade became inextricably entwined with the supply of sugar rarely meeting demand. The misery associated with the sugar trade belies the sweetness of the crop and the perfect circle of trade and misery in slaves, rum and molasses. Sugar was so profitable in the tropical Americas that the Dutch gave up New York in return for Surinam in the 1670s and the French swapped Canada for Guadaloupe in the West Indies in 1763. The abolition of the British slave trade was hardly the last word in the challenges sugar presents for human wellbeing and for sustainable production. Worldwide sugar cane is a massive crop – FAO’s 2010 data suggests it was grown on about 23.8 million hectares, in more than 90 countries, with a worldwide harvest of 1.69 billion tonnes and with a consumption of 57kg per person in the USA and 36kg in the UK in the 1980s – a figure likely exceeded today. When you’re enjoying the remainder glacé fruits after Christmas, focus on the sweetness and light visible in the fruits and the matching of colours, tastes and textures surviving their marathon imbibing of sugar in solution. Ian Tolley OAM and Noelle Tolley AM’s glacé cumquats are a special treat (tolleysnurseries.com.au – Tolley’s Nurseries at Renmark also trades as The Cumquatery!) and given our experience preparing our own seem remarkably good value. The Smelly Cheese Shop at the Adelaide Central Market usually has a fine display of glacéd fruit including Tolley’s cumquats and, for an Australian Christmas, glacéd quandongs. Ditters offer a wide selection of glacé fruits (dittersgawlerplace.com.au). Unfortunately no longer through Virgin Hills in the Riverland – Australia’s major producer succumbed to cheaper imports and closed in 2011. Originally published in The Adelaide Review on 6 December 2012.